Brian Tyler says "Our areas of responsibility are those surrounding projects and solutions in Visual Studio - specifically the C++, C# and VB project systems - but we're involved in other code bases in those areas as well." and explains that he's going to start the blog with these C++ topics because the conversion of the VC++ project system from VCBuild to MSBuild was a major effort in VS 2010. I'm really happy about the VC directories thing. It made moving projects from one machine to another very brittle that things like which version of a header file you got were machine-specific instead of project specific. The blog as a whole is a must-read if you're going to do any C++ work in Dev10. A client asked me to help recently with a small mystery. They had a database provided by a customer and they'd been asked to import the contents into the tables used by their own product. One of the tables had a BLOB column and from context they were quite sure it was used to hold scans of documents. There was even a "filename" column and a "filetype" column that suggested very strongly the scans were stored as TIFFs. Found short (ten lines including initialization and cleanup) code to read one blob in VB6 and save it to disk. Found the TIFF format details, looked in the resulting file with notepad and confirmed it didn't start either II or MM and so wasn't a TIFF. Looked at a few other file formats but wasn't really gaining any knowledge, just ruling things out that you could rule out by renaming and double clicking, then having the file rejected by the app that tried to open it. Removed the extension from what had been test.tif, pointed TrID at it, and was told 100% it was a zip file. Duh, the file started PK, I might have guessed that one. Presto! A scan of a document! I left my client to write the code that did all the blobs, including unzipping them and renaming (every single blog contained a zip which contained a TIFF renamed to file.txt and no, I don't know why) from within a quickly written importer application. The big mystery was solved. Thanks, Marco! I admit it, I read my referrer logs. I want to see what kinds of searches bring people here, or who is linking to me. I think a lot of the single word searches (women, or shirt, or december) are blog spammers looking for posts to spam on. And some are clearly my name, names of my friends or folks I blog about, conferences I'm speaking at. The majority is things I know about, things for which I want to be your expert source: /clr:pure, windows 7 taskbar, uac manifest file, marshal_as and so on. Yay. OK, it's not spaced like that in the standard. But who'da thunk it? Want to go to PDC but not sure you can afford it? How would this work for you: a trip to PDC including flights, hotel, and conference admission? That's the grand prize in the INETA Component Code Challenge. Write an app (web, client, whatever) that uses at least two different components (a grid and a chart? a PDF creator and a calendar? a report and a spreadsheet? You decide.) from the sponsors. Try it! And maybe see you in LA! Here's another tip from Habib on debugging. If you have a particular screen you want to bring up, and it takes a lot of clicking and selecting to bring it up, why not just set a breakpoint and then bring it up by constructing and calling it with the immediate window? Habib's video features a WPF application, and the constructor takes no parameters, but you could use this for Windows Forms and you could pass through whatever parameters you needed to. A very handy tip - any language, any kind of client application. So here is not so much a tip as an announcement. You see , it's no coincidence that my examples for conditional breakpoints were numbers (some index into a structure is greater than 346, or Xid is 1234.) Until now, you couldn't really use strings in conditional breakpoint expressions. But the cool news is that, starting with Visual Studio 2010, you can! You can't just call arbitrary functions including your own foo(whatever), but you can call a pretty impressive list of variants on strlen and strcmp. The details on are Habib Heydarian's blog. Just one more reason to want Visual Studio 2010! Finally, XP2Win7 is released! I've been watching this one for a long time. 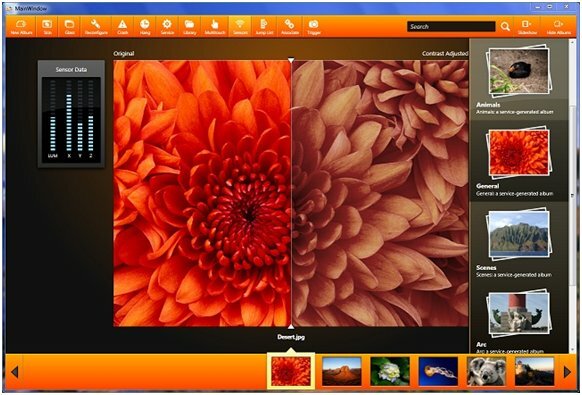 It's designed to show off both Windows 7 features and development good practices. 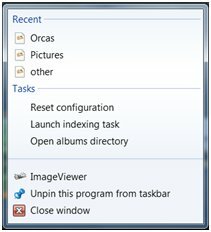 The same binaries behave differently on XP and on 7 - on 7 it lights up and shows 7 features like the taskbar or libraries support, as well as Vista features that never got the attention they deserve like Restart and Recovery. It also uses the new Sensor support, Aero glass effects, trigger-started services for backing up images when a USB key is inserted, MMC and Powershell integration, the new Event Tracing for Windows (ETW) and so much more. This will be your roadmap to Windows 7 development. Of course all the code is available, as well as a simple MSI if you'd just like to play with the application a bit and understand what Windows 7 has to offer. Get your copy and start learning and exploring!